June 2018, Nomad camp near to Castelnuovo Rangone, Emilia-Romagna, Italy. The faithful of the Sinti community pray during the evangelical worship. The evangelical religion is becoming more and more established within the community, thanks to the possibility of redeeming oneself from sins and of embarking on a new way of life. 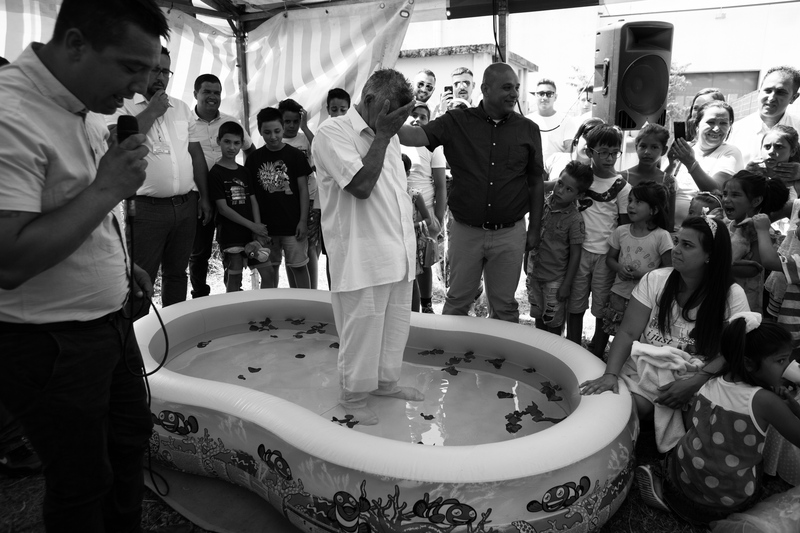 In fact, these cults are reaching ever greater numbers of believers through adult group baptisms and children. May 2017, nomad camp of Castelnuovo Rangone, Emilia Romagna, Italy. A group of children plays with the water cane, to counter the torrid heat that has characterized the Po Valley since the spring. Within their area of the field there is only one tree, and in the absence of shade the temperature and the heat are perceived much more intensely, also due to the asphalt on which the field itself rises. May 2017, nomad camp of Castelnuovo Rangone, Emilia Romagna, Italy. A moment of meeting and sharing among some inhabitants in front of the campers of one of Linda's daughters. January 2018, nomad camp of Castelnuovo Rangone, Emilia-Romagna, Italy. 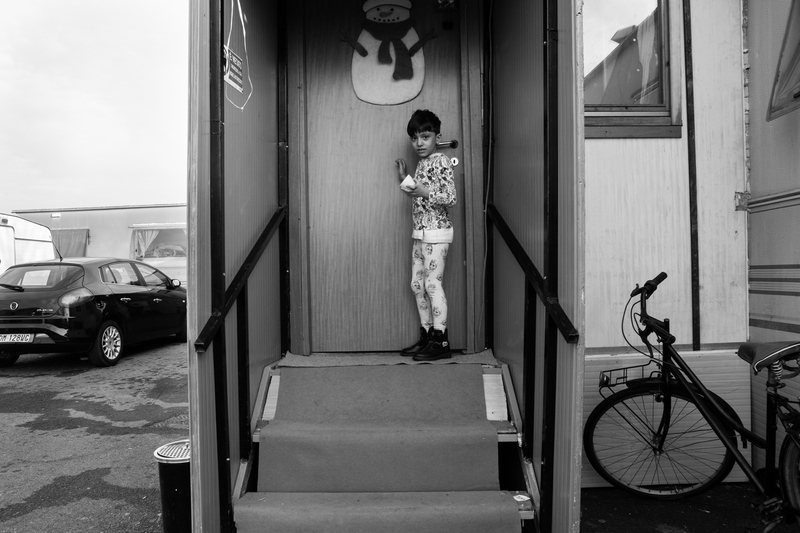 Marina in front of the entrance to her own mobile home. February 2017, nomad camp of Castelnuovo Rangone, Emilia-Romagna, Italy. 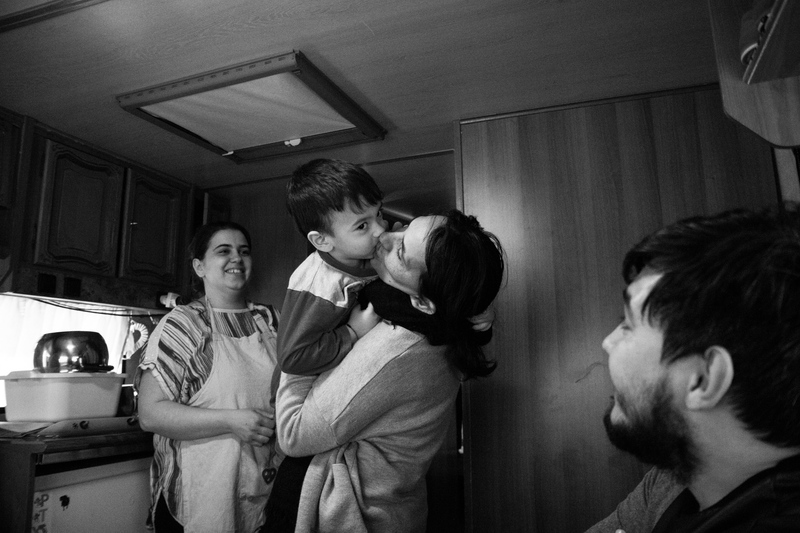 Moment of joy and intimacy between Linda and the family of one of her daughters inside the mobile home. February 2017, nomad camp of Castelnuovo Rangone, Emilia-Romagna, Italy. Rocky plays cards in his mobile home while he shares his cigarette with Lady, his wife. February 2017, nomad camp of Castelnuovo Rangone, Emilia-Romagna, Italy. 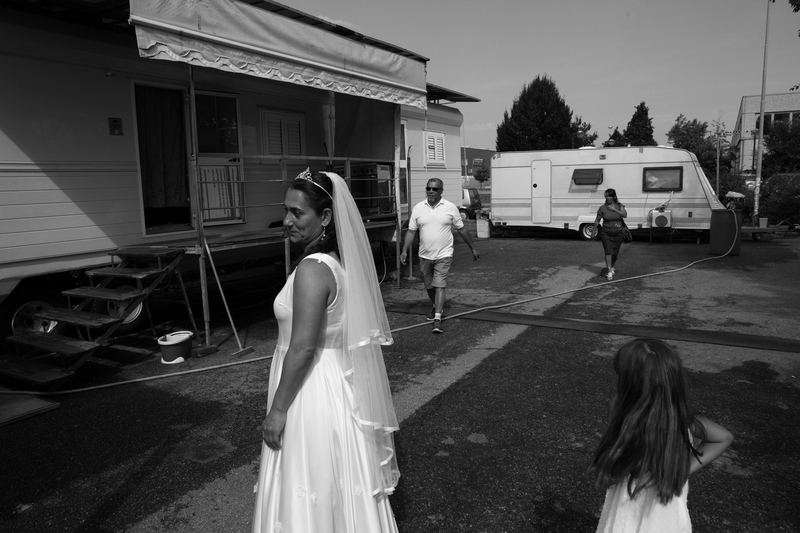 Simonetta and her father wait for coffee in the living room of Lady and Rocky's mobile home. February 2018, nomad camp of Castelnuovo Rangone, Emilia-Romagna, Italy. Sissi changes her first child into her mother's mobile home. August 2017, Soliera, Emilia-Romagna, Italy. After a long day of work to mount the carousel on the occasion of the fair, Elix greets his brothers before returning home. They meet sporadically throughout the year, and fairs are one of those occasions when families can meet to work and spend time together. August 2017, Soliera, Emilia-Romagna, Italy. 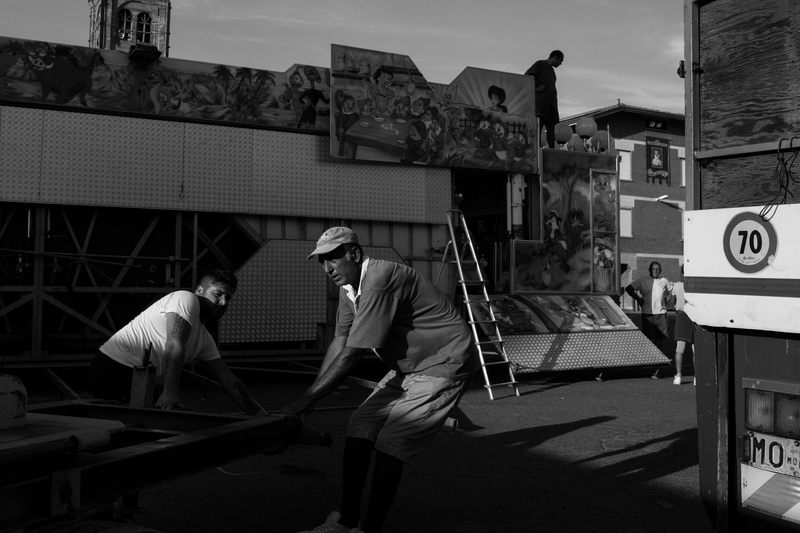 Felix and his family are moving the tagadà carousel, preparing for the summer fair. They meet sporadically throughout the year, and fairs are one of those occasions when families can meet to work and spend time together. August 2017, Soliera, Emilia-Romagna, Italy. 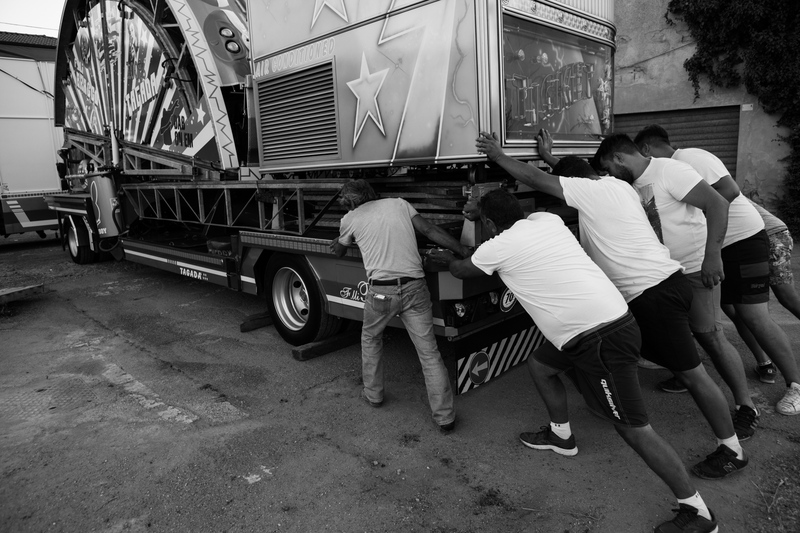 A Sinti family at work for the assembly of the carousel, a few days before the country's fair. August 2017, Soliera, Emilia-Romagna, Italy. 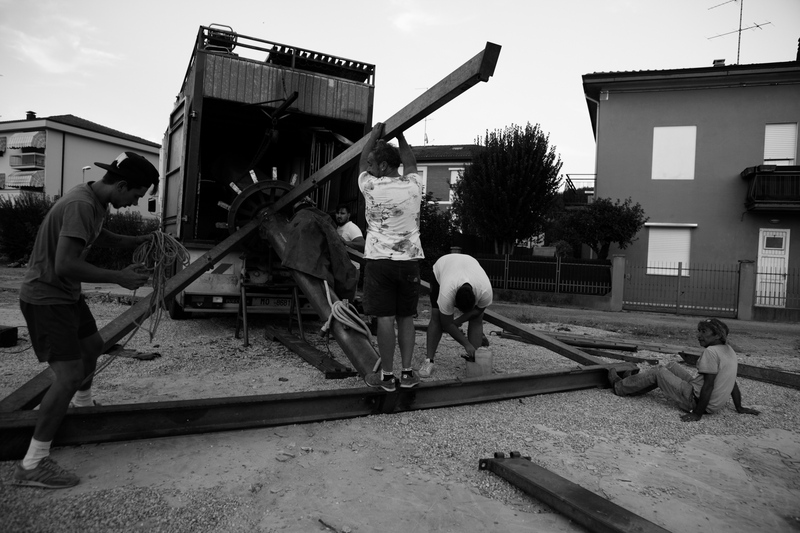 Elix and his brothers work on assembling their carousel, a few days before the country fair. They meet sporadically throughout the year, and fairs are one of those occasions when families can meet to work and spend time together. 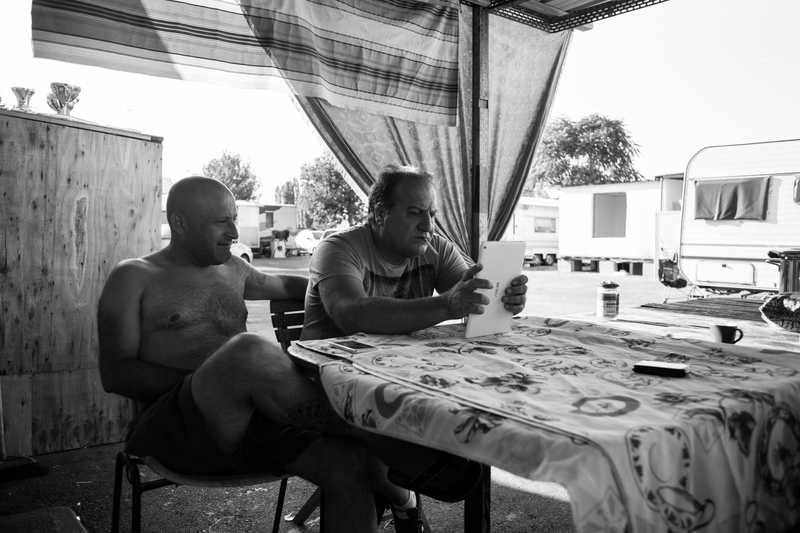 August 2017, nomad camp of Castelnuovo Rangone, Emilia Romagna, Italy. Chantal, in a princess dress pulled from a sheet, gets up from the table where she was eating, called by her mother. 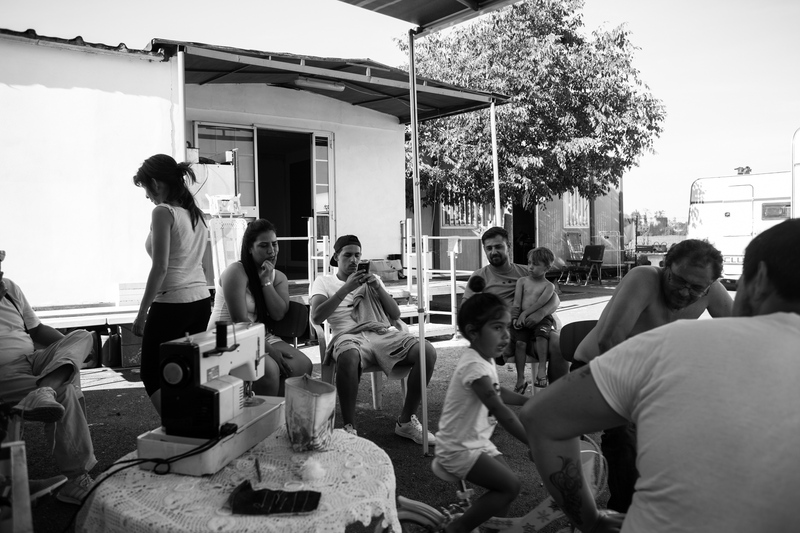 August 2017, nomad camp of Castelnuovo Rangone, Emilia Romagna, Italy. Linda prepares two cakes with the help of Vicki, her daughter and her grandchildren, in front of her mobile home. She will bring the cakes to a nomad camp not too far away, where she has been invited to dinner by some of her relatives. August 2017, nomad camp of Castelnuovo Rangone, Emilia-Romagna, Italy. Rocky discusses with Simonetta's husband after dinner. 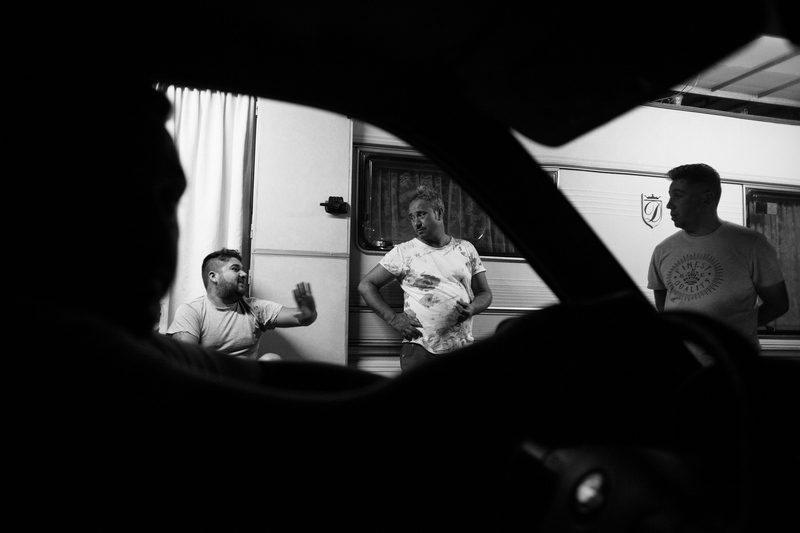 August 2017, nomad camp of Castelnuovo Rangone, Emilia-Romagna, Italy. Linda cooks for her family and her sister's. March 2017, nomad camp of Castelnuovo Rangone, Emilia Romagna, Italy. Linda, her daughter and sister are about to enter the mobile home where evangelical worship takes place. 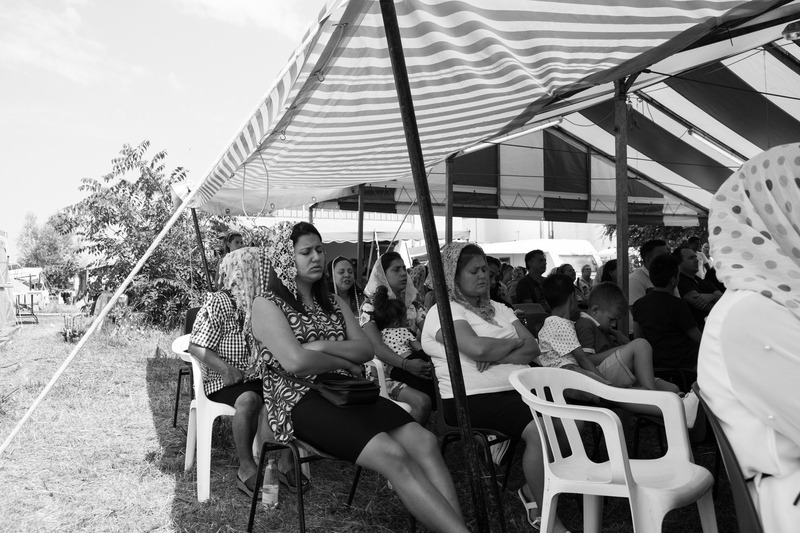 Evangelical cults are gaining ground within the Sinti community. The shepherds, also of the Sinti ethnic group, move from field to field to support the various cults and involve an increasing number of faithful. 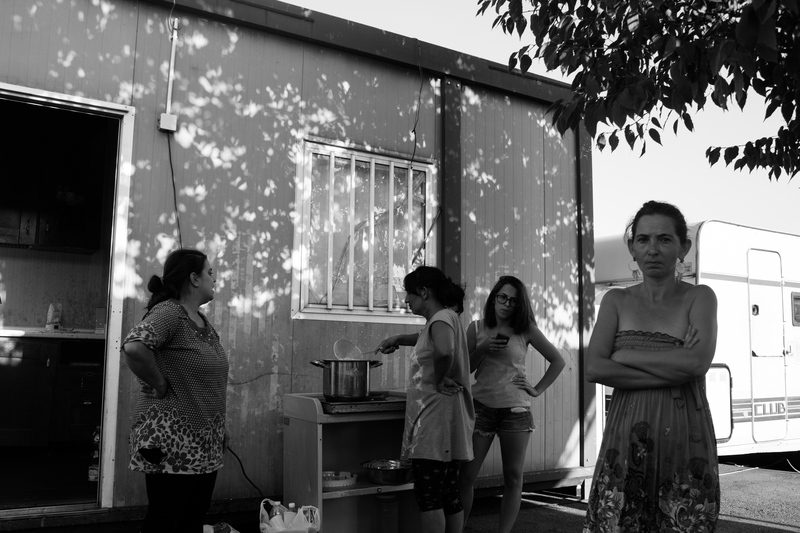 August 2017, nomad camp of Castelnuovo Rangone, Emilia-Romagna, Italy. Two adults in the community watch some videos from the tablet. April 2017, nomad camp of Castelnuovo Rangone, Emilia Romagna, Italy. Moment of rest shortly after the Easter lunch held inside the camp. 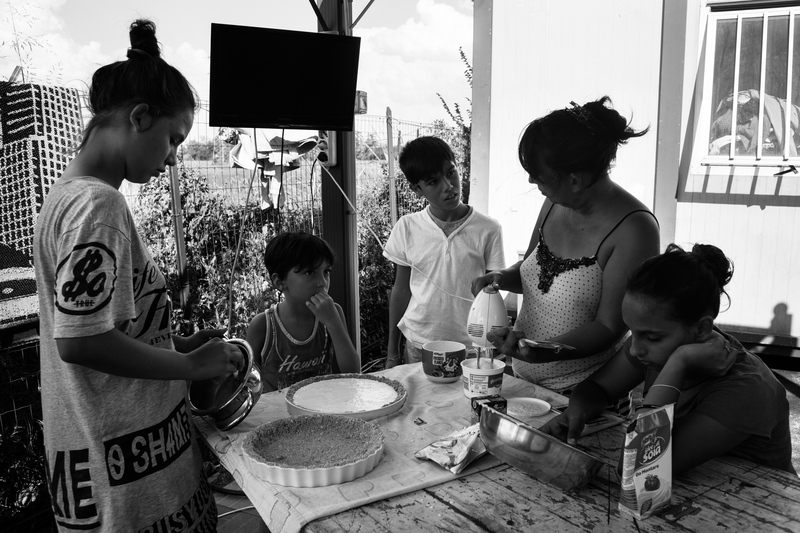 August 2017, nomad camp of Castelnuovo Rangone, Emilia-Romagna, Italy. Chantal plays with her mother's phone just before sunset. August 2018, Nomad Camp near to Castelnuovo Rangone, Emilia-Romagna, Italy. Linda's cousin feeds her sonduring the preparation for the family summer lunch. 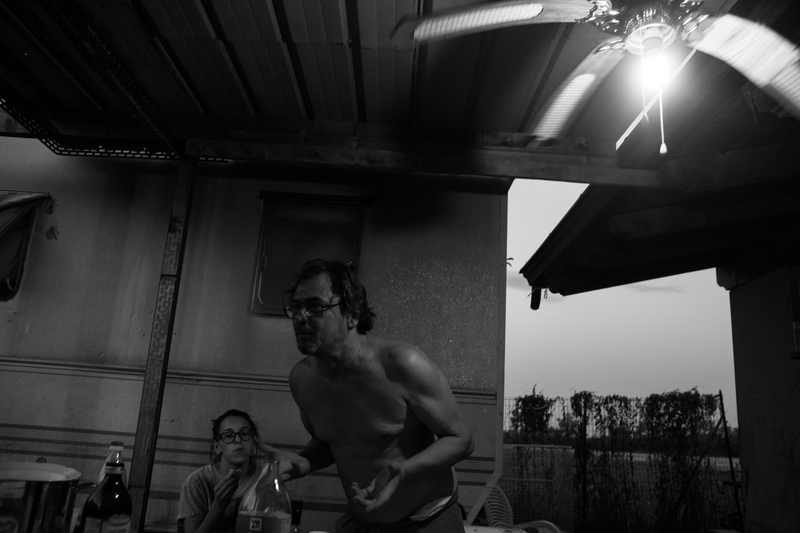 August 2017, nomad camp of Castelnuovo Rangone, Emilia-Romagna, Italy. 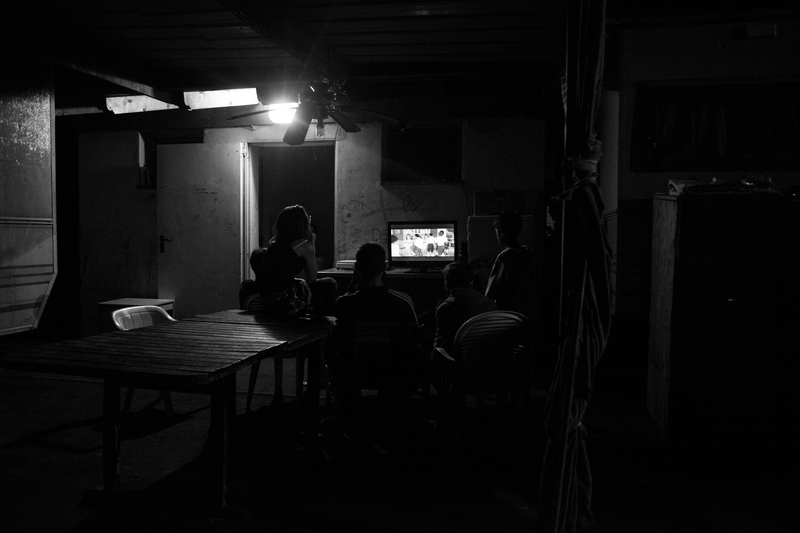 Childern are watching tv outside at late night. August 2018, Nomad Camp near to Castelnuovo Rangone, Emilia-Romagna, Italy. Gianni is going to take his evangelical baptesim, after a year of participation in evangelical cults. The evangelical religion is becoming more and more established within the community, thanks to the possibility of redeeming oneself from sins and of embarking on a new way of life. In fact, these cults are reaching ever greater numbers of believers through adult group baptisms and children. August 2018, Nomad Camp near to Castelnuovo Rangone, Emilia-Romagna, Italy. Linda's cousins is dressed up for starting her evangelical baptesim cerimony. The evangelical religion is becoming more and more established within the community, thanks to the possibility of redeeming oneself from sins and of embarking on a new way of life. In fact, these cults are reaching ever greater numbers of believers through adult group baptisms and children. August 2017, nomad camp of Castelnuovo Rangone, Emilia-Romagna, Italy. Marina plays volleyball with her sister. 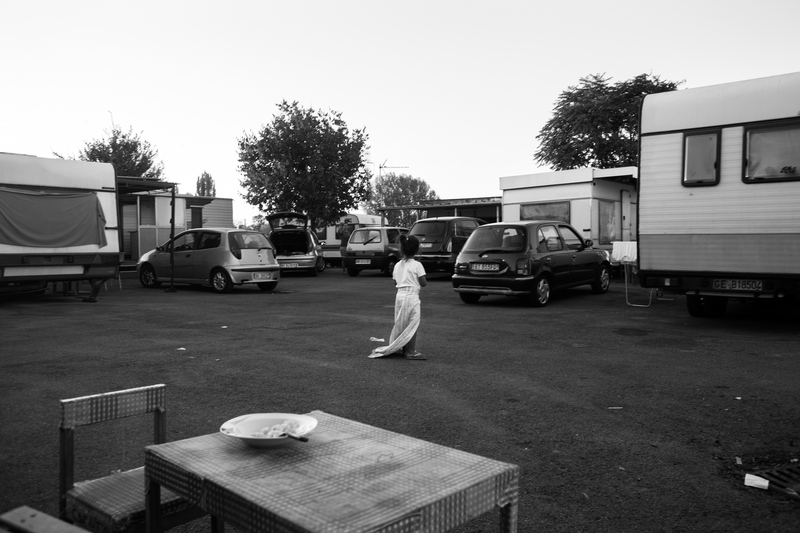 May 2017, nomad camp of Castelnuovo Rangone, Emilia Romagna, Italy. 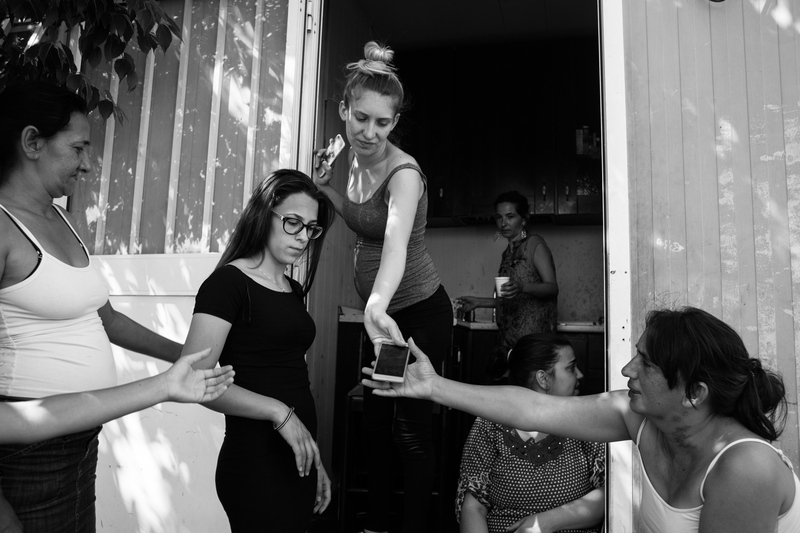 The women of different families exchange a smartphone to watch a news on the internet. Not everyone has a cell phone in the camp, and those who share it with the whole community. 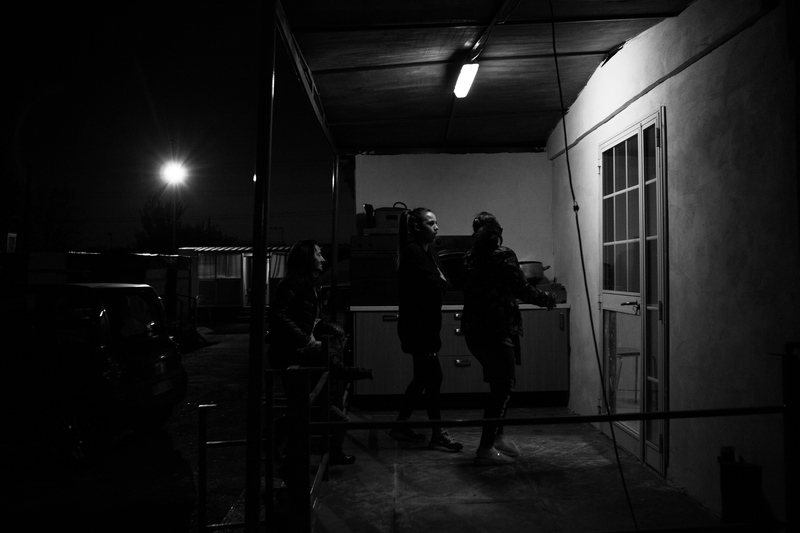 February 2017, four children play hide and seek inside the nomad camp of Castelnuovo Rangone, Emilia-Romagna, Italy. February 2017, nomad camp of Castelnuovo Rangone, Emilia-Romagna, Italy. 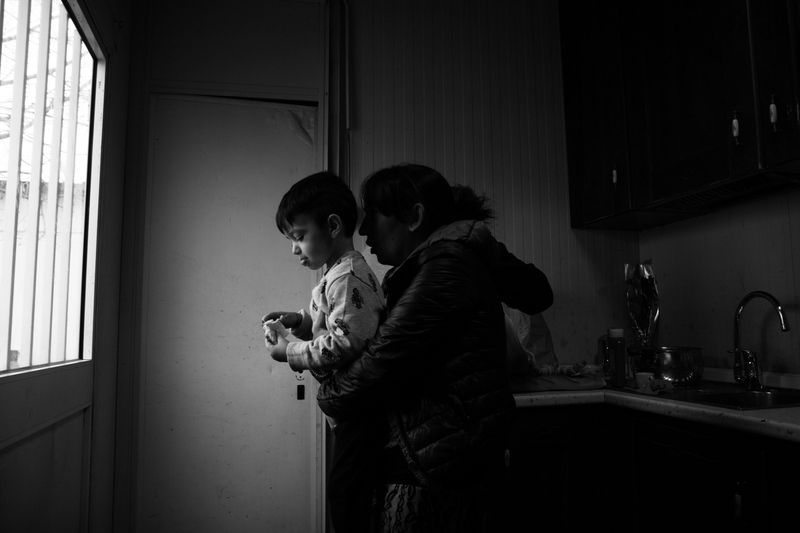 Linda hugs her grandchild inside her trailer. March 2017, nomad camp of Castelnuovo Rangone, Emilia Romagna, Italy. 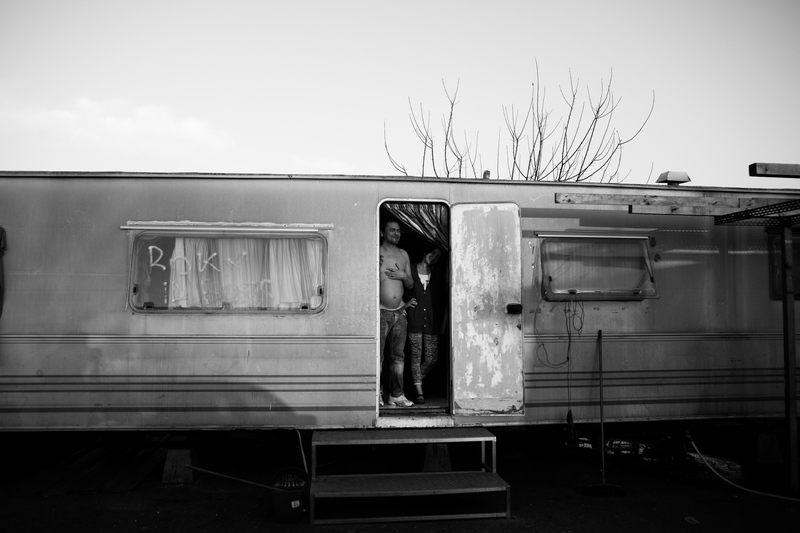 Rocky and his wife greet friends from the threshold of their mobile home. Since ancient times man has had to build bonds to survive the adversities of nature and to be able to evolve. Over the centuries, human coalitions have thus become the main tool for progress in evolution and for creating a broader body. Mutual support, sharing and collaboration were therefore essential means necessary for the society that wanted to reach a goal. In concomitance with all this, the mistrust of those who are not part of their group or social context has been established in man. This mistrust has always been exploited to support the invasions and the territorial conquests and of entire populations. With the Roman conquest policy, once conquered a territory, the ultimate goal was to "convert" the inhabitants to the lifestyle of the conquerors, to begin to be part of the social life of that people and not become slaves or rejected. Today, this diffidence towards the different has now become an integral part of society and collaboration and mutual support are increasingly neglected. Living in an era in which the IO is the most important part of an individual's life, man is increasingly inclined to rely only on himself, distrusting more and more from contact with others and especially with others. With the arrival of technology and the web, more and more isolation from reality and intermediation between human relationships is developing, making man an individual who, although connected with everyone, is losing his sense of community and the ability to trust others. This leads to a greater difficulty of mutual sustenance within the Western community, which to this day increasingly develops mistrust and intolerance. 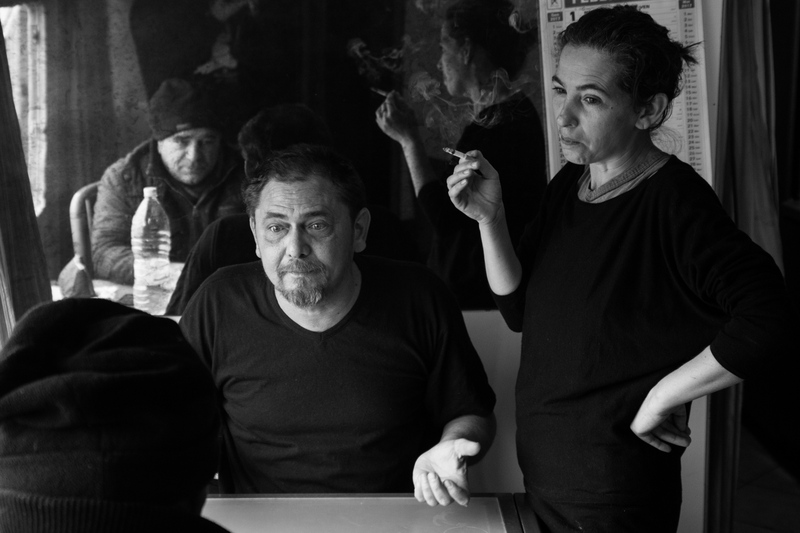 'Sinti - A Family Portrait' tells the reality of a bubble detached from time and the space that surrounds it, bringing back the intimate portrait of a culture that - despite being often ignored and unknown - is still alive and strongly present in the territory. A tribe carrying a rhythm of life that allows it to live strongly the sense of community and making sharing an integral part of the collective life: the Sinti tribe. The Sinti are a nomadic ethnicity until the middle of the last century coming from the north of India and settled throughout Italy and in the rest of Europe. It is a people that has always been discriminated against, and since ancient times it has suffered all kinds of persecution. Just think of the incredible treatment reserved for them during the Nazi period, where the Sinti were deported to concentration camps or massacred in the host countries. Today the different Sinti communities are now an integral part of the European territory where there is the search for a real integration with the local culture, despite a sudden increase in intolerance and fear towards the different. 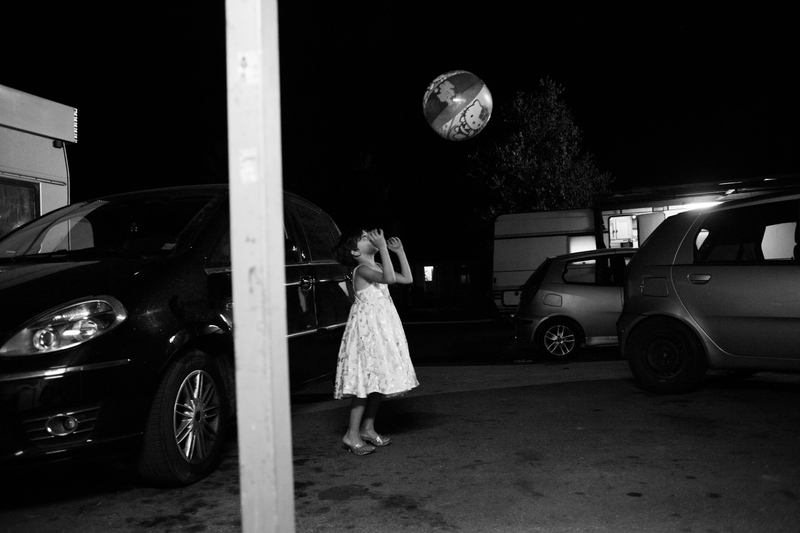 Italy is the European country where intolerance towards Roma and Sinti is more widespread, in fact, it is the only country in Europe where the camps exist, created to solve the housing emergency of Roma and Sinti citizens. 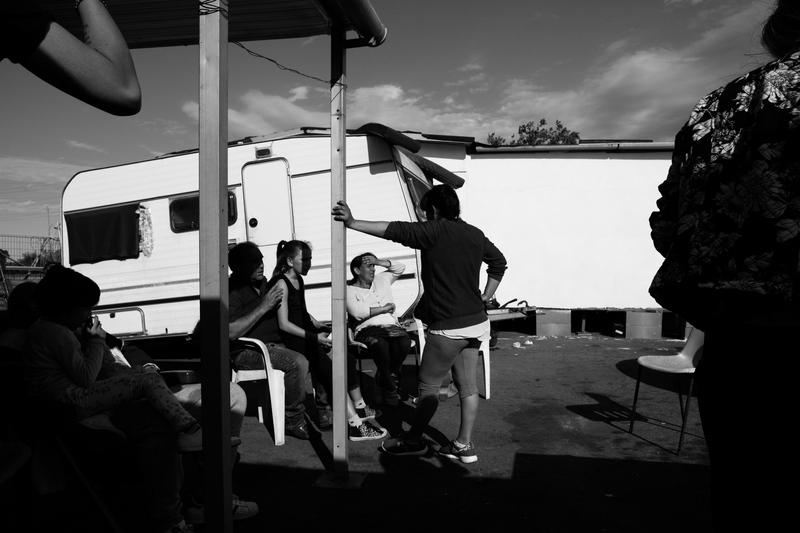 In the last year I have visited several camps within Emilia-Romagna, the region with the highest density of Sinti inhabitants nationwide, getting in touch with some families and being able to tell this tribe and its great ability to make community , their constant sharing of spaces, personal assets and the strong sense of mutual support that characterizes and sustains life within the field. A people that lives proudly preserving what is an ancient and precious culture, composed of a strong sense of community and family.